The Black dawn approaches. Reset within the month. Over 100 new items following the reset. Give input now or put up with Jarak's crazy vision of a brave new world. So, nearly a week in and a whole world of things for me to fix. As you may have heard, open beta testing starts at midnight on Wednesday (or Thursday, if you're being pedantic). The game won't be perfect, but it will be playable and most of the stuff should work. That's a stupid time - I've moved it forward to 5pm. Soooooo many bugs to fix - but everything is progressing well (except for the fact that I'm re-coding the fight engine, but hey-ho). Here's the interesting news, though - Little Savages 3 will be in opened up for Beta testing before the end of February. And that's not an estimate, it's fact - no matter what state the game is in on the 28th (if I can't get it done before) you'll all be able to 'play' (although the game proper won't start for about a month after that). That means that all the classes for version one of Little Savages three are done! Work is plodding on - I'm now going through the big list of bugs and suggestions the alpha testers have supplied me with. Two days after the last blog entry I was shot in the eye with a toy gun and blinded for a week - a week that just happened to be the week I was planning to do a whole load of LSav3 work in (oh, and Christmas was in there, too). So I'm behind schedule, and I was so close to getting it done on time! The end of January is the latest estimate for a fully-featured beta. Today a savage had a baby, which was alive and well. This marks the completion of the last really complicated thing the engine has to do - I should be able to fly through the rest of the stuff. Look out for a full launch early next year! However, my Wii turns up on the 8th! Judging by how well things are going at the moment, I fully expect LSav3 to be in at least in Beta by the end of this year. Just a quick one to point out the change in complexity between LSav2 and LSav3. In LSav2, I used 40 SQL fields to store the information on a single savage. In LSav3, so far, I've got 98, and I'm adding more (and forgetting what others are for) daily. Well, the forum has been tested by myself and some helpful LSav2 players, and everything seems to be working pretty well - at least, it's several worlds ahead of the LSav2 forum. 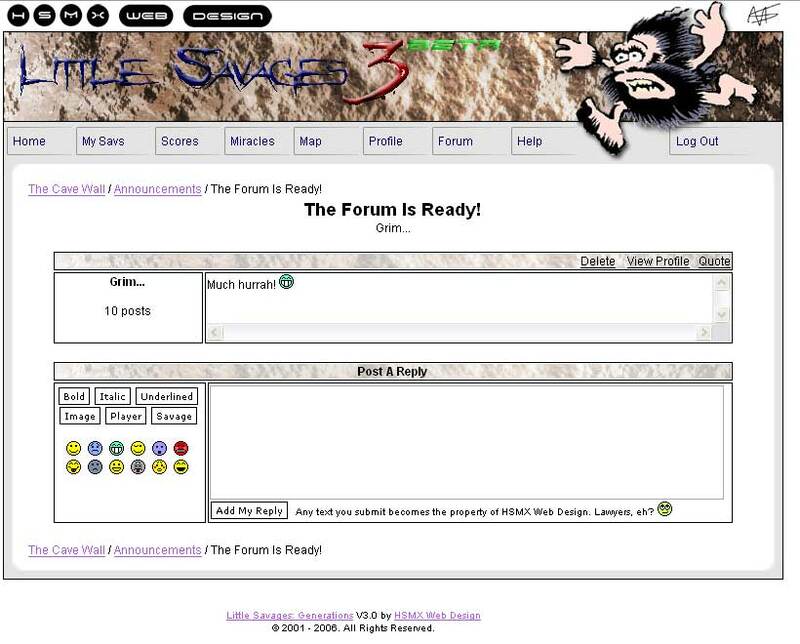 I'm actually really pleased with the LSav3 Forum (or the Cave Wall as it's more correctly called) - it does a lot of clever things and seems pretty robust. IE7 is giving me some difficulties, but that will be sorted out soon. Oh - and the Spy page (now called 'history') is working. A rough 'meeting' code is in place, and savages can make friends, enemies, fall in love, and hump. Also, the help system is in place - it's a kind of wikiHelp, meaning that any LSav3 players can enter information for everyone else. After a weekend on hard coding, things are moving on. Savages are fighting and having babies, which are the two most complicated things they can do (besides meet each other for the first time) so it's nice to have those out of the way. On with the 'meeting' function! A soldier savage - brave, fit and tough - he needs to work on his fight skill though. The cave wall - the new LSav forum. Miracles - there's not much to choose from at the moment, but people keep suggesting new ideas. Create a savage - really simple this time round. It may get a little more complicated, but I doubt it. Just thought I'd make it clear: LSav3 is going to rely quite heavily on RSS feeds to keep you players up to date. RSS feeds are helpful little things that automatically update to tell you new information, thousands of sites make use of them. To read an RSS feed, you need an RSS reader. If your browser home page is a bit dull, you could do worse than live.com - this can read feeds. For more information, look at this. Assassin: When first attacking other savages, an assasain gets the chance of a free critical hit if they remain undetected. Breeder: Use these to get your population up. Childrearing is very different in LSav3, with pregnant sav's unable to do much, and childbirth being quite a dangerous thing. Baby savs can't do anything either (except cry). Builder: Builders can build things that inventor savages create. Enticer: Stunning-looking savages that can entice enemy savages into your clan. Explorer: Explorers like to look around the map. Who knows what they'll find? Guard: These savages stand guard around your camp and protect the savages inside. Hunter: Hungry? These savages will do their best to provide all the food your clan needs. Inventor: Big-brained savs that come up with new weapons, armour, and other cool things. Miner: You builder is going to need something to build with, and that's where this sav comes in. Priest: As all the cool things you as a player can do depend on how well-behaved your savages are, you're going to need a priest to keep them in check. Soldier: Soldiers march across Saville Island and attack enemy camps! Spy: Need to keep an eye on what someone else is doing? Use a spy. Teacher: Teachers can teach savages new skills, and, over time, even a whole new class! I've done a fair bit of work lately - I'm just finishing off the fighting engine. What's interesting about building a game like this is that you plod along and plod along and suddenly, when you still think you've got loads to do, it's finished, with just the edges to be smoothed off. But I'm pretty sure I'm nowhere near that stage yet. People keep asking me when it's going to be finished, and I honestly don't have a clue. Some point this year, folks. Work is marching on - The LSav Engine is horribly complicated since orders and miricles have been added to the game, but it's going quite well. I just thought I'd let you know, as it's been a while since you've heard from me. I'm working on the SavEngine (Version 3, fact fans) at the moment, and I hit an exciting milestone. I gave one of my savages an order to go to sleep, and she did. The LittleSavages.co.uk domain has gone live, and I'm pointing it straight at this blog for now. I have registered littlesavages.co.uk, and now it's bedtime. Here's a list of (planned) differences between LSav2 and LSav3, and (planned) new features. Special (and rare) savage skills - will your savage be able to go for years without eating, or develop psychic powers? I'd love to hear any ideas you have - drop me an email. LSav3 is coming along well - I've now completed the 'create savage' pages, with most of the information needed to create a savage held in the database, so I can tweak it easily when the game starts running. I thought I'd better start the Dev Blog. Are you impressed?